Need an offline dictionary that is very powerful, and allows youtotrack the words you are learning? 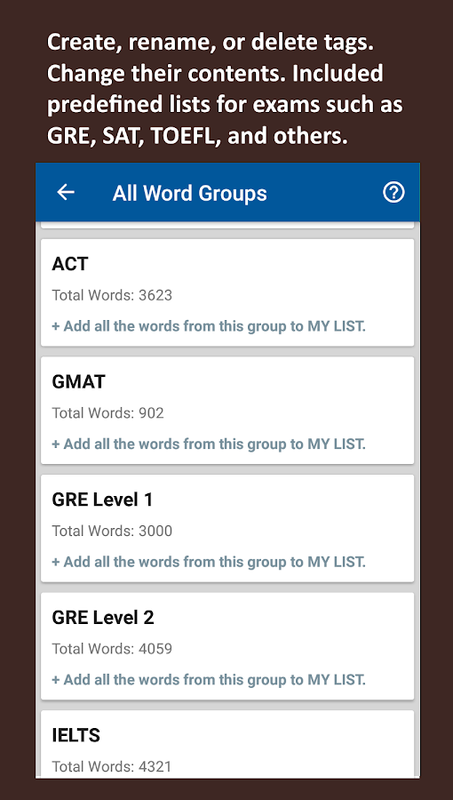 My Word List is a powerfulwordlist app / English offline dictionary with over 800,000words,terms, and idioms: more entries than any other app in themarket.And over 1 million examples. See for yourself. Internet isnotrequired to use it. If you like to learn new words in Englisheveryday, or want to improve your vocabulary, or are studying foranexam, this app is for you. It helps to maintain a list of thewordsyou are learning. As you learn more and more words, you cansearch,review them, track their learning status, add notes, andwhen youfeel like you have mastered them, you can check them asmastered inyour list. You will never lose a word again! Wheneveryou arewatching a movie with subtitles, or reading an article, andcomeacross on a word that you don’t know, you can add it to yourlistand learn it with My Word List. LIST OF FEATURES: •Offlinedictionary with over 800,000 terms. • Offline examplesentences. •Study for GRE, SAT (over 7,000 words included for GREand SAT).Study lists include GRE, SAT, ACT, TOEFL, GMAT, IELTS,LSAT, MCAT,PRAXIS, TOEIC. • Clean, easy to use interface. • Searchby voice orby typing. • Shows word frequency (“popularity orranking”). •Works in landscape and portrait mode. • Add any words,terms orsentences to your list, including ones not in thedictionary. • Thedefinitions are already included. Add your ownnotes, changelearning status. It automatically updates stats:added, updated,last viewed, or mastered dates, the total number ofviews. • 4Learning levels: New (1), Learning (2), Advanced (3) andMastered(4). Each level has different colors. 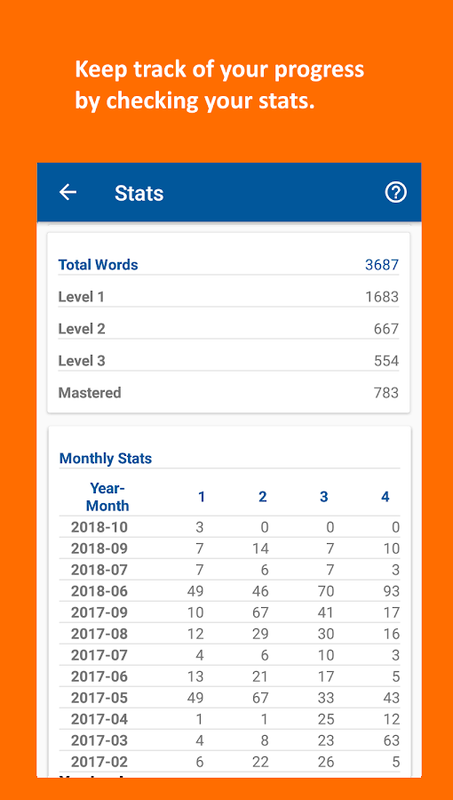 Update your level asyou go.• Word Finder tool allows you to locate your personal wordsinarticles. If you want to know what words in your personallistappear in the article you read, this tool is very useful. •Linksto Google Definition, Translate, Google Image and Videos,Websterdictionary (online) • Listen to the word’s pronunciation inUK andUS accents. 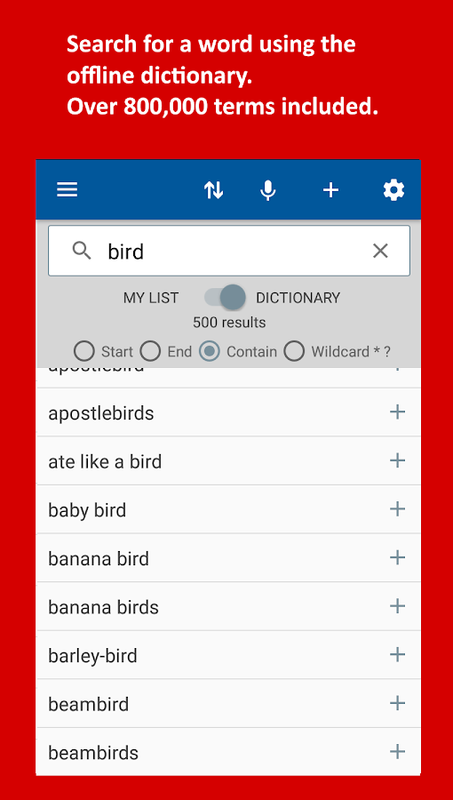 • Search the dictionary or your personal wordlists.using partial word searches, custom filters, and sort orders.Sortby frequency, or alphabetical order. learning status, or thelastday you viewed, modified or added the words. • Wildcardsearchavailable, search for words with certain letters, withpatternssuch as * and ?. 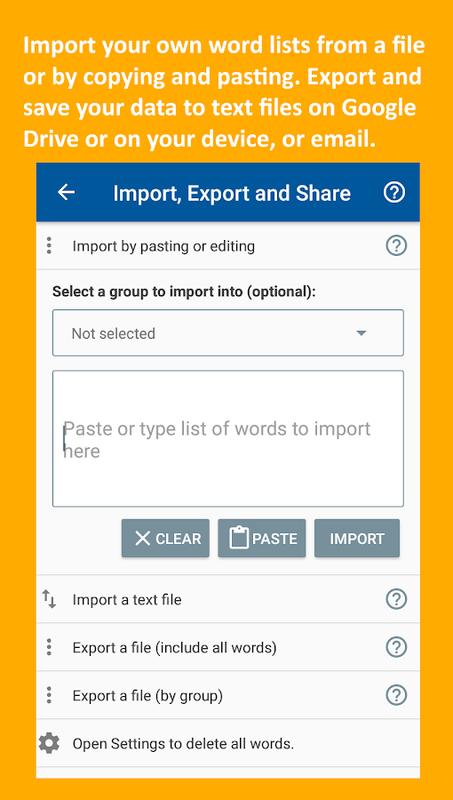 • Create your own groups or custom lists.Eachword can belong to multiple groups. • Lookup a definition fromanyapp. 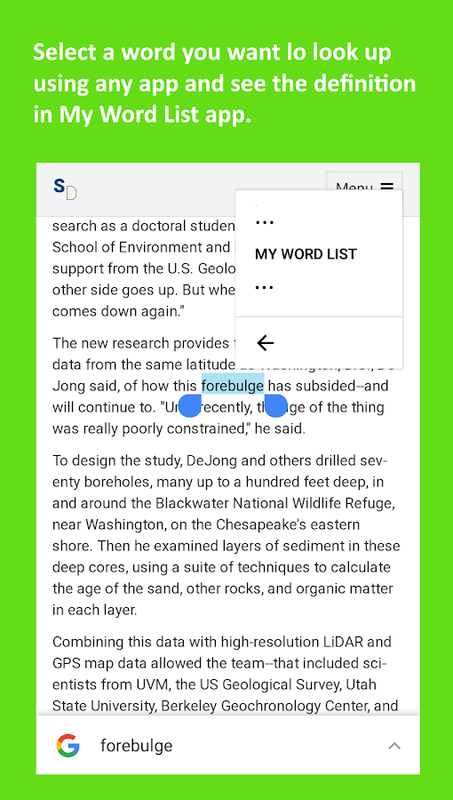 Simply highlight the word in an app. It will open up apopupmenu (Copy, Share …). Select the 3 dots, and then select theMyWord List menu link. It will take you to the definition screen.Addthe word to your list if you wish. • Customizable font size forthedefinition, notes, and examples. 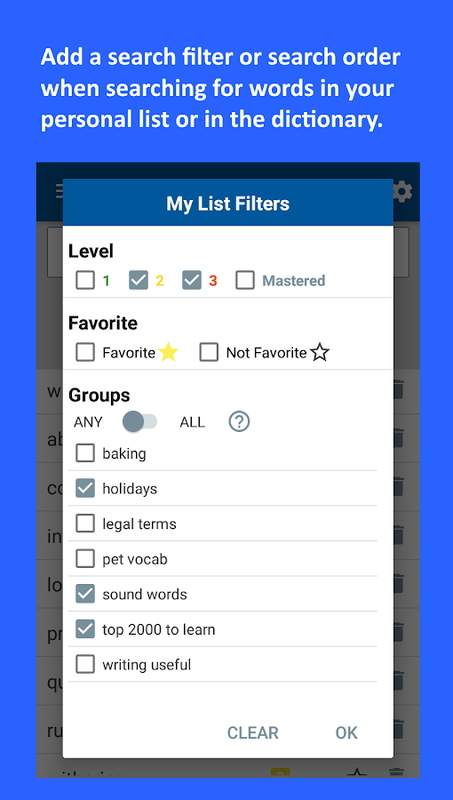 • Recent word search history.•Import your own word lists into the application. Backup andsaveyour data to a text file. Import the same data later if youneed. •Automatic backup/restore in your google account. If youreinstallthe app under the same account, your data will berestored. •Customizable reports. Export your data to atab-delimited text filethat you can open in Excel or Googlespreadsheet, including notes,add/update/mastered/last view dates,status, lists, anddefinitions. • Check your progress with stats:total, today’s,yesterdays and monthly stats. We want to make thisapplicationbetter. We value your feedback. If you want us to changesomething,or add features, or have any issues, please email us. Wewill beadding more features in the upcoming releases. You cancontact usat [email protected] Wish you success in yourEnglishlearning journey and thanks for using our app! English to Hindi and Hindi to English dictionary and translatorwith OFFLINE mode by HinKhoj. Download the largest hindi englishdictionary with over lakhs of Hindi and English words. Meaning ofwords are provided with definition, synonyms and antonyms. Meaningsare provided with usage and example sentences to understand propertranslation. One can listen pronunciation of Hindi and Englishwords to read and speak words properly. BUILD VOCABULARY This apphave lakhs of english and hindi words. It helps in building yourvocabulary by daily words meaning, word of the day alerts. You canfind words and track them for learning. You can practice wordlearning by playing word games like hangman, scrabble, cross word.This app have spell checking tool which can tell correct or wrongspelling for words. Audio pronunciation tool help in listeningcorrect sound of words. HINDI TO ENGLISH DICTIONARY AND TRANSLATIONHinKhoj is best app to find meaning and definition in english forhindi words. Translate hindi words to English quickly using thisapp. You can type in Hindi directly and find meaning in hindienglish dictionary. This dictionary can be used as english hindiconverter. Through this dictionary children can learn names of bodyparts, vegetables , fruits , flowers, name of different animals. Itcan help in reading daily newspaper in english. ENGLISH TO HINDIDICTIONARY AND TRANSLATION Easily translate word from english tohindi using HinKhoj Dictionary. Now translate english words tohindi easily on mobile phone. It has largest collection of englishwords in dictionary. This dictionary show exact meaning along withnear by meanings. See meaning with synonym, antonym and rightgrammar usage. LEARNING APP This app can help in learning bothHindi and English language. Words are provided with proper grammarusage like Noun, Verb, Adjectives, Pronouns etc. Many idioms areexplained via examples. Difficult words are explained with examplesand detailed definition. Daily word learning help in buildingvocabulary for language. Synonym of words help in knowing similarwords and antonym of words help in knowing opposite meanings. Spellchecker can help in avoiding common mistakes. One can track searchhistory and mark words as favourite. TRANSLATION COMMUNITY Lakhs ofpeople are connected via app to help in answering questions relatedto translation. One can ask meaning and translation of sentences onapp. USERS LOVE IT It is most popular english hindi dictionary overinternet. It is totally FREE, provide OFFLINE mode along withONLINE searches. No need to download offline dictionary files. Itworks without internet connection. Hindi words are displayed inDevanagri fonts on all devices. Search is quite easy due to autocomplete and hindi typing tools. हिंखोज सबसे अच्छा हिन्दी अंग्रेजीडिक्शनरी (शब्दकोश) है | Hinkhoj dictionary me lakhon shabdkon kewords meaning hai. Kisi bhi shabd ka matlab janiye and angrejisikhe. Mobile par hindi aur angreji shabd ke meaning check karo.Bina internet ke translation kare. Hindi se english me translatekare. For more information and to try it out on web please visit:http://dict.hinkhoj.com We hope you will like it and review it onGoogle Play Store. Please feel free to contact us [email protected] for any suggestion. The only free online and offline dictionary and thesaurus withevery word you look up. Millions of definitions from the mosttrusted sources, including: Webster's Dictionary Roget's ThesaurusThe American Heritage Dictionary Plus FREE access to: EnglishOffline Dictionary English Offline Thesaurus with synonyms,antonyms, and related words Word of the Day Medical DictionaryEnglish Idioms and Slang Dictionary Translations of English into40+ languages Dozens of other translation options + Much more! TheFree Dictionary is like getting 100+ dictionaries in oneuser-friendly app. See why we have top ratings after millions ofdownloads: * Find every word you look up. Clear, precisedefinitions from the best dictionaries—online and offlinedictionary access. * Find synonyms fast. Free Thesaurus with aneasy-to-use interface helps you find the perfect word every time. *Learn something new every day. Word of the Day Idiom of the Day +Other daily content * Build your vocabulary. Learn the words youlook up. Featuring: Audio pronunciations Example sentencesEtymologies + More! * Explore your favorite topics. Multiplespecialty dictionaries and encyclopedias: Idioms and Slangdictionary Medical dictionary Legal dictionary Science dictionaryFinancial dictionary Acronyms and Abbreviations + More! * Play funword games. Spelling Bee, Hangman, Match Up, and more. * Watchidioms in action. Play idioms videos inside the app! Animateddefinitions of words and phrases from the idioms and slangdictionary. * Access dictionaries in 13 other languages: Spanishdictionary and thesaurus French dictionary and thesaurus Germandictionary and thesaurus Italian dictionary and thesaurusPortuguese dictionary and thesaurus Russian dictionary andthesaurus Chinese dictionary + More! * Translate English intoSpanish, French, and 40+ languages. Or translate other languagesinto English, plus dozens of other translation options. * Accessdictionaries and encyclopedias from industry-leading publisherswith just one search: McGraw-Hill Houghton Mifflin HarperCollinsRandom House Cambridge University Press Columbia University PressElsevier Mosby's + More! Here's what makes The Free Dictionary theeasiest dictionary app to use: * Define any word in any app. Justhighlight the word and "share" with The Free Dictionary app. *Voice search. Look up any word just by saying it. * Look up anyword on the page. Just highlight it and tap the search icon. * Savethousands of bookmarks and sync them to any device. * Customizeyour homepage: Move, add, or remove articles, games, even localweather. * Jump to Definition, Thesaurus, or Translations with onebutton. * Navigate the app in more than a dozen languages with themultilingual interface. * Adjust font size. * Share your favoritewords via social networks, email, or text. * Advanced searches.EXCLUSIVE * Earn meals for hungry children through The FreeDictionary's partnership with the World Food Program—just by usingthe app! This is not a trial version—you get everything free andforever. Additional offline dictionaries in other languages areavailable in the Pro version. Sound too good to be true? Read realreviews to see why our users say The Free Dictionary is the bestdictionary app they've ever used. * For app developers: The FreeDictionary app can be accessed by other apps with API calls(Contact Farlex for instructions). This application is dedicated to one of the most complicated topicin the English language — Phrasal Verbs. There are dozens of rulesand nuances in this topic, but we have made maybe the easiest wayto deal with it. When students face a phrasal verb for the firsttime, they usually do not know how to translate it and then how touse it. The problem occurs rather often because there are more than10 thousand phrasal verbs in English. That means, that we meet themevery day in the spoken and written language. But at the same time,such a big number does not mean that all of these phrasal verbs areof common usage. The majority of them just rest inside thevocabulary. Native speakers know them but they hardly use them inevery day speech. That is why we have collected phrasal verbs ofwide usage. They will help you extend your vocabulary andunderstand native speakers. Being the developer, we take much careabout our users. We understand clearly that it is not appropriateto give just a list of verbs like all other vocabularies do. It isnot comfortable for learning, understanding and practice. We reallybelieve that learning apps should develop students’ skills in aclear and simple way. That is why you will find a very friendlyinterface and useful functions inside the app. We have included 247phrasal verbs. You can read and learn them in two ways: — use analphabetical list and open a card with the verb you do not know; —swipe each card one by one. Every card contains a simpleexplanation and an example of usage. Also every verb is markedseparable/inseparable. Students can use bookmarks to form the listof necessary phrasal verbs. After you have studied the verbs youare able to check your knowledge. We have made up a collection oftests where users are offered to choose the needed phrasal verb orto choose the needed meaning. When you complete a test the appshows you the result and mistakes. And one of the most importantthings about our app — it is absolutely free.